POSCO’S steel plant project in Odisha may get stalled again. As the state resumes acquiring land for the country’s largest foreign direct investment project—US $12 billion—it faces a fresh litigation and mounting protests. Communities refuse to part with forest in the mining area and river water for the South Korean giant. A couple of weeks after the Union Ministry of Environment and Forests (MoEF) gave its nod to divert forestland for the largest foreign direct inproject, an excited state government on May 18 sent officials to acquire land in the project site in Jagatsinghpur district. They were escorted by armed police and carried signed cheques. By 11 a.m. the government declared acquisition of 11 betel gardens in four villages and disbursal of Rs 17 lakh to the owners as compensation. At around the same time, about 1,000 people gathered at Balitutha village, entry point for the project site, protesting the acquisition. There was no confrontation between them and the 600-odd policemen deployed in riot gears. “There will be no land acquisition without people’s consent,” said Chief Minister Naveen Patnaik. “But I never gave my consent,” says Baraja Swain, a betel farmer in Nuagaon village, contradicting Patnaik’s assurance. The officials demolished his 12.9 decimal (1 decimal=0.004 ha) farm while he was away and gave the compensation of Rs 1,42,000 to somebody else. Most betel gardens in this area are on community forestland and hence no record of ownership. The government is cautious. “Strategically, we are focusing on government land at the outset. We need the project to progress a bit however superficial it is,” says a secretary to the government who is monitoring the acquisition. The government has to hand over about 1,500 ha to POSCO, of which 80 ha is private-owned. “We will acquire 1,800 betel gardens this month,” says Muralidhar Swain, the block development officer of Erasama. Officials had acquired 96 betel gardens last year. They had to stop within days of starting on July 27 after MoEF issued a stop-work order saying the state was violating the rights of forest dwellers in the project area (see ‘POSCO gets final clearance’, Down To Earth, May 16-31, 2011). On May 17 this year, a day before the government resumed acquisition, six residents from Dhinkia and Nuagaon villages, two staunchest opponents of the project, filed a public interest petition in the Odisha high court, demanding the land diversion be stopped. The petitioners contended they did not give consent for diverting their forestland, which is a must under the Forest Rights Act of 2006. The petition also contests forest clearance by MoEF. On May 21, the high court asked the Central and state governments to reply. Till the time the magazine went to press the governments had not replied to the court and the land acquisition was going on. Anti-POSCO leader Abhaya Sahoo says the government should stop land diversion as the matter is before court. The petition has also brought under judicial scrutiny the diversion of forestland in Khandadhar hills in Sundergarh district for POSCO’s captive iron ore mines. In 2006, the state gave POSCO exclusive mining rights in over 6,000 ha of the hills, bypassing some 225 companies; many had applied for mining rights before the state signed an MoU with POSCO. Some companies approached the high court, which in July 2010 scrapped POSCO’s mining license. The state is now contesting the order in the Supreme Court. Communities living around the hills, mostly tribal, are also campaigning against the project. They say mining the hills would destroy their water sources and forest, which is their major source of living. Khandadhar forest is also home to Paudi Bhuiyans, a primitive tribe, for whom the hill is of religious significance. “Mining here will never start. Resistance is very high,” says Renu Choudhury, a priest of the tribe. If the petition lingers, it will be a major setback for the project, admits a senior official of POSCO in Bhubaneswar. Resistance is also brewing over the decision to divert river water for the project. After opposition from people in Cuttack, the government has decided to source water from Hansua river in Jagatsinghpur instead of the Mahanadi. This has further irked the residents of Jagatsinghpur. “We oppose the diversion of water meant for irrigation,” says Sanjaya Jena, a farmers’ leader and zilla parishad member of Erasama. 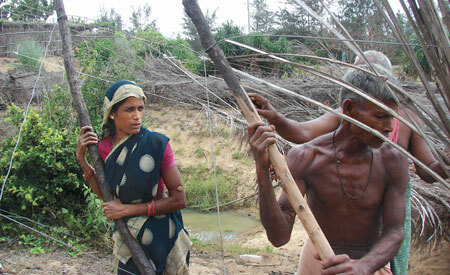 Residents say the Hansua irrigates farmlands in Biridi, Erasama, Kandarapur and Tirtol blocks, a major paddy belt. Diverting its water will affect more than 200,000 farmers in the region, allege residents who are planning protests.